My research interests are varied. I have recently discovered the personal gratification that can result from service to the public. This has lead to an increased exploration of Education and Outreach opportunities. In 2005, I was PI on a funded project entitled Earthquake Town Meeting originally intended to develop a protocol for organizing and conducting a Town Meeting within days of a significant earthquake in the affected area. The Town Meetings provide a forum to share information about the New Madrid seismic zone, emergency management, recent earthquakes, and general earthquake preparedness with the public. The protocol was developed in planning the first two Earthquake Town Meetings held in Blytheville, AR and Dyersburg, TN to address public concerns that the “big one” was imminent following three widely felt (approximately magnitude 4) earthquakes. Since hurricane Katrina, the Earthquake Town Meetings have been adapted for presentation about disaster preparedness to local at risk communities. In addition to a presentation about seismic hazard and disaster preparedness, the public is invited to question a panel of experts that typically includes a FEMA and USGS representative; the state earthquake program manager or PIO; state, regional and local EMA, and can include local politicians. Town Meetings have been held in Caruthersville, MO; Sikeston, MO; Piggot, AR; Jonesboro, AR; and Princeton, KY. Two Town Meetings are planned for western Tennessee as part of Earthquake Awareness Week in Feb. 2007. I also chair a committee that will participate in a regional earthquake exercise in June 2007. While the exercise is primarily testing multi-state environmental hazard and emergency response systems to a large earthquake in the NMSZ, the University of Memphis, the US Geological Survey, and the Geological Surveys of Arkansas, Missouri, and Tennessee will exercise the implementation of Post-Earthquake Information Clearinghouses in coordination with Emergency Management in those states. We are holding a Central US Clearinghouse Workshop in April to address unique issues related to the regional scale (multi-state) of such a disaster, as well as, conducting a table-top exercise in June. I am involved in a Seismic Risk Study of West Tennessee Water Utilities and a study of the Seismotectonics of the New Madrid Seismic Zone. And I have recently completed a study of the Broadband Characteristics of Earthquakes Recorded during a Dome-Building Eruption at Mount St. Helens, Washington, between October 2004 and May 2005. Mount St. Helens from south west following steam eruption. 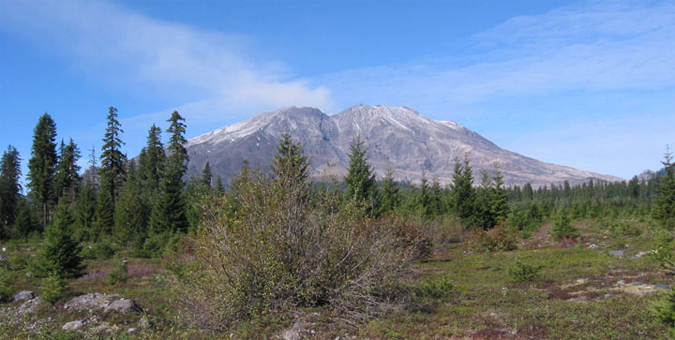 A network of eight broadband seismometers was installed at Mount St. Helens in October 2004 to record seismic activity associated with the dome-building eruption that began on September 23. The Cascades Volcano Observatory installed two broadband seismometers northwest of the Mount St. Helens crater in October 2004. CERI installed six temporary stations at complimentary azimuths to provide better coverage of the eruption at about the same time. CERI removed the temporary stations in May 2005. Contact me for graduate research opportunities!